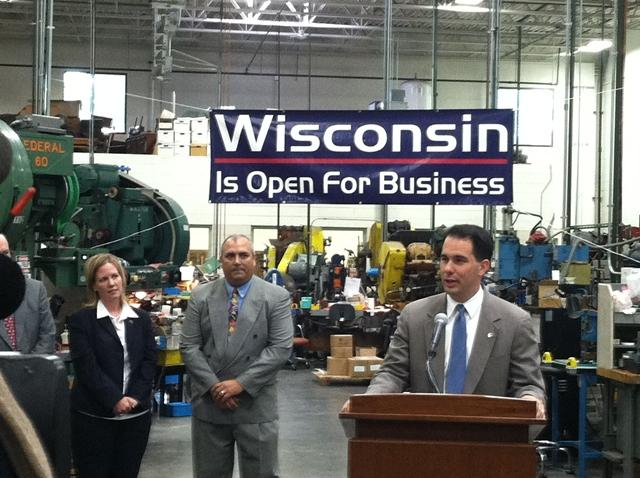 Walker Rewards Kimberly-Clark For Layoffs? Proposed state deal gives company subsidy if no more than 7 percent of workers eliminated. Wisconsin keeps paying more to profitable corporations to subsidize manufacturing, while demanding less in return. In fact, the Governor’s proposal to subsidize Kimberly-Clark jobs would pay that corporation roughly $7 million per year over the next 15 years—if they agree not to cut jobs by more than 7 percent. Compounding the problems, the proposed deal would allow the company to back out at any time, without giving up any of the generous subsidies it has received. Although the proponents of the proposed subsidies refer to them as “tax credits,” that is misleading because manufacturers already receive a state tax credit that eliminates almost all of their state income taxes. There are essentially no restrictions on that credit; manufactures like Kimberly-Clark and Harley-Davidson can claim the current credit even if they lay off workers, shut down factories, or ship jobs overseas. Wisconsin’s Manufacturing and Agriculture Credit will cost the state an estimated $324 million this year, which is far more than state policymakers anticipated when the provision was quietly slipped into the 2011 budget bill. This massive expense—which is more than all the tuition and fees combined paid by students in Wisconsin’s technical college system—was supposed to make Wisconsin very attractive to manufacturers, but that doesn’t seem to be working. The number of manufacturing jobs in Wisconsin increased by less than 1% from December 2015 to December 2017, compared to a national increase of nearly 1.7%. Corporations like Kimberly-Clark and Harley Davidson are scaling back their Wisconsin workforce, and doing so without jeopardizing their eligibility for the generous Manufacturing and Agriculture Credit. Because the existing tax credit for manufacturers virtually eliminates their income tax liability, the new subsidy proposed by the Governor would require annual cash payments to Kimberly-Clark. The proposal is very similar to the extraordinarily generous deal the state has entered into with Foxconn—with state taxpayers picking up the tab for 17% of employee wages and 15% of capital expenditures. The state would also give Kimberly-Clark a new sales tax exemption for capital purchases. Although those details of the proposed Kimberly-Clark subsidies are essentially the same as the deal with Foxconn, the new proposal (contained in Assembly Bill 963) includes a significant twist that makes it even worse. Whereas Foxconn will have to create new jobs in order to get the new 17% and 15% cash subsidies, Kimberly-Clark would merely have to lay off fewer employees than it has been threatening to dismiss. The commitment of more than $100 million of state spending on behalf of Kimberly-Clark over the next 15 years would be a terrible precedent, since other manufacturers would have a strong incentive to threaten job cuts, even though we have already essentially eliminated their responsibility to pay state income taxes. In addition to the complete lack of any corporate accountability for results, one of the problems with the state’s existing subsidies for manufactures is that they widen the growing economic divide in our state by lining the pockets of people who are wealthy and well connected. 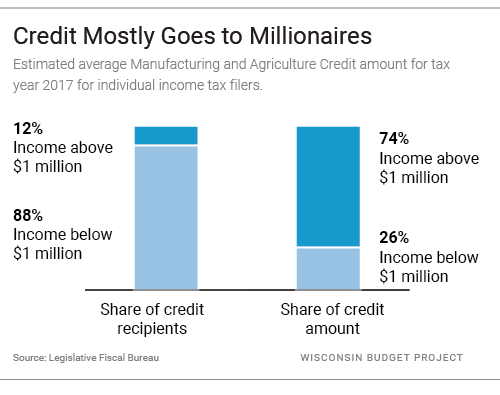 Millionaires take home nearly three-quarters of the portion of the Manufacturing and Agriculture Credit claimed through the individual income tax, despite making up only 12% of the claimants (and a much smaller share of the total population). In fact, just 15 credit claimants—all with incomes of at least $30 million—received a combined tax break of $28 million from this credit. That averages out to a tax cut of a whopping $1.8 million each for these extremely wealthy claimants. These figures are based on the Legislative Fiscal Bureau’s analysis of the costs and distribution of this credit. Proponents of corporate subsidies sometimes attack the critics of corporate welfare by contending that they do not care about workers and job growth. That’s a lot like saying parents do not care about the safety of their family if they don’t buy a luxury car with all the latest safety features. State budgets, like family budgets, require setting priorities after weighing the pros and cons of many different spending options. Wisconsin can ill afford to throw money at the most politically powerful corporations, at the cost of being able to make investments in areas like education, transportation and health that would deliver a much larger boost in economic growth. Despite Wisconsin’s very generous tax breaks for corporations, our job growth has been lagging well below the national average. Wisconsin ranked 30th among the states in the rate of growth of manufacturing jobs between December 2015 and December 2017, based on the most current “gold standard” employment figures from the Quarterly Census of Employment and Wages. After the Foxconn deal, it is not surprising that some legislators in the Fox Valley want Kimberly-Clark to get similar cash subsidies, on top of the state’s other tax credits. But the Foxconn deal was extraordinarily generous, and the state can’t afford to throw cash at every corporation that is cutting jobs or threatening job cuts. Doing so would make it more difficult for the state to make investments in its communities and families, and would hurt the state’s long-term economic competitiveness.